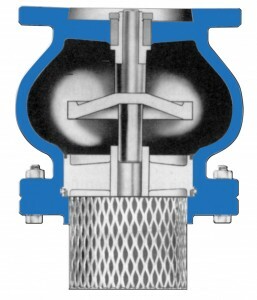 Full Flow Foot Valves can be installed at the bottom of a pump suction line, inside the wet well. Foot valves are an inexpensive way to maintain prime on a single centrifugal pump. The Foot Valve is designed with a 10% larger flow area (including heavy stainless steel strainer) than the pipe size to insure minimal head loss. APCO Full Flow Foot Valves designed to have the high quality, long wearing construction necessary for valves that are continually submerged in a wet well and not readily accessible for inspection or repair. Foot Valves have heavy cast bodies, rugged bronze internals and drip-tight resilient seating to prevent loss of suction. The resilient seal is compression molded (not glued or chemically bonded) onto the seat for long life.